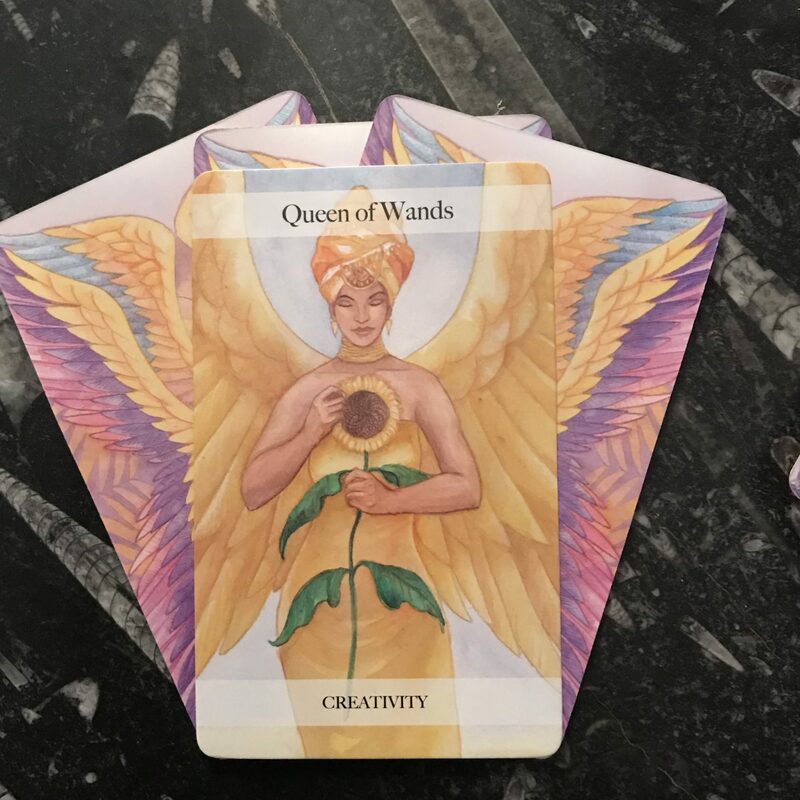 The Queens represent someone who has now matured and added a healthy dose of understanding, and feminine energies of nurturing and caring to the actions that were taken. Essentially, in the stage of the Page, the ideas were conceived, and those ideas were acted upon in the Knight stage. But now, in the Queen stage, those actions are nurtured, cared for and developed further into a sustainable scenario. Meaning The Queen of Cups is the Queen of Hearts – her world turns on emotion, relationships and giving. As an individual, she is compassionate, generous and protective towards you, and often represents the ideal friend, family member or partner. As a situation, she asks you to express and honour these aspects of yourself; listening and acknowledging others’ feelings and, in your projects, going inward, delving into your imagination and soul to problem-solve and come up with innovative ideas. Power Message What can you contribute: time, love, ideas, support? Give what you can. Meaning This Queen acknowledges your creativity and asks you to step into your power. This card, therefore, reveals self-expression and great communication, so now is the time to launch an idea or project, write that book, imagine your ideal future – and make it happen. She reminds you, too, to look to your intuition for answers. In relationships, you understand each other, an intuitively know what you and your partner need to be happy. Power Message Express yourself, but don’t get frustrated with those who are guarded and closed down. Let your intuition guide you toward kindred spirits. Meaning The Queen of Pentacles is traditionally an earth-mother, close to nature and her family, whom she does everything in her power to protect and assist. As a friend in need, she is the perfect confidante and problem-solver. However, she is also the successful business leader who nurtures your career, and offers practical, non-nonsense guidance. When this card arrives in a reading, you’re offered exactly what you need, when you need it. Power Message What needs doing? Get on with those tasks you usually avoid, and you’ll free up more time for the projects and people you love. Meaning This Queen has a fast mind and a sharp tongue. While she is respected for her strength of character, she may be unreasonable, asking too much or herself or of others. She often arrives in a reading to show women who are highly self-reliant; this may be women in relationships with demanding careers, those in leadership positions, or single women and single parents. As a situation, you are asked to call upon your inner strength. Power Message You can make a decision just for you - without getting others’ opinions or agreement first. Now it is time to put all your together and star to do readings for your family or friends.